I remember the first time I starting questioning if Norrin had autism. We had just come back from our first visit with the developmental pediatrician and I immediately called my mother. “What if it’s autism?” I asked. “Norrin’s not like that,” my mother said. And I admit…even I was doubtful. While Norrin wasn’t talking, I told myself that it couldn’t be autism because he was smart and affectionate. 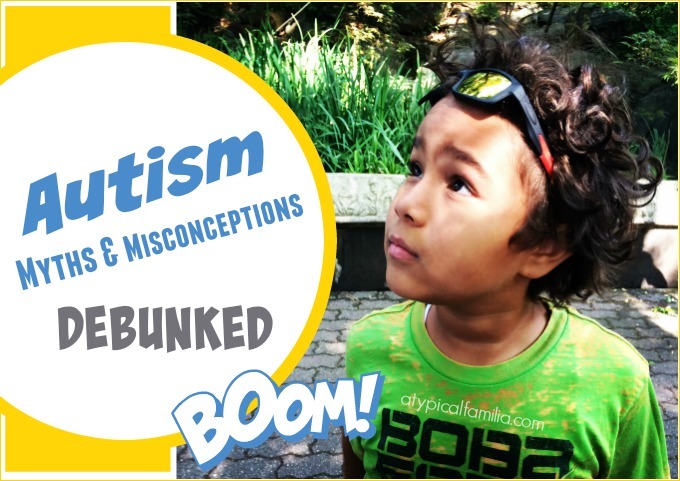 We all had our own myths and misconceptions about autism. And when Norrin was diagnosed we had no choice but to separate autism myth from autism reality. Is he like Rain Man? I think if I had to pick a favorite, the Rain Man/Savant myth would be it. People often ask me if Norrin has a “special talent” and I think they’re disappointed when I tell them Norrin is just as talented as any other kid. All moms consider their kids to be a rock star genius, and I’m no different. But my kid isn’t like Rain Man or Temple Grandin or that guy who drew the NYC skyline after flying around once in a helicopter. The reality is only a very small percentage of individuals with autism are considered savants. Don’t get me wrong, there is a small part of me that hopes Norrin could count cards well enough to be whisked off to Vegas. Wow! He is really smart! This is something I hear a lot. And it’s often said with surprise. Especially from people who meet Norrin for the first time. Sometimes I find myself quizzing Norrin on things just to show off how much he really knows. I try to remember to cut people some slack on this one, because in the beginning I remember thinking that autism equated intellectual disability. Norrin taught me that autism doesn’t always impact cognitive ability. And he surprises me every day with how much he knows. People with autism like being alone. This is tough because Norrin is often alone. I’ve learned that Norrin does best one on one. If we’re at the park and there’s one other kid, Norrin may engage in some sort of play. But if the playground is full of kids, he’ll opt to play alone. Socialization is Norrin’s biggest challenge, but I’ve seen him try. I’ve heard him ask for kids he knows. There are times when I’m in another room and he’ll come to find me. He’ll take me by the hand and ask me to read a story. It isn’t often that he invites me into his world, but when he does – I’m there. So many kids with autism want to make that social connection, they just need to be taught. Autism is the result of bad parenting. I think this is the one that hurts parents most because it plays on the guilt every mom or dad feels following an autism diagnosis. This myth is based on Bruno Bettelheim‘s 1950s theory of the “cold mother” and that autism is caused by unloving mothers. When I think of all the autism parents I’ve met, I am just in awe of their dedication to their children. While there is no known cause for autism, it is an “invisible” disability. And for those who don’t know what autism is, when a child has a public meltdown – it is often the parent that is judged for their lack of control or parenting skill. Believe me when I say – AUTISM IS NOT YOUR FAULT! People with autism cannot express emotion or understand feelings. Norrin is extremely sensitive and has a full range of emotions. He can tell me if he’s happy, sad or angry but he can’t tell me why. And when he’s feeling sad or angry, he asks for a hug because he knows it will make him feel better. There have times when he’s seen me cry and he runs to get a tissue so he can dry my tears. If he thinks I’m sad, he’ll give me a hug or a kiss. If he sees I’m upset with him, he tries to straighten out my furrowed brows. And if he sees me laughing, he’ll ask for tickles so he can laugh too. Norrin may have difficulty expressing himself but he is understanding and aware of peoples feelings. Are you sure he has autism? He looks so normal. Or sometimes people will say, “He has autism? I never would have guessed.” If I had a dime for every time I heard this I could take a cruise around the world. Autism doesn’t look like anything; there are no distinctive physical features. If you saw Norrin running around at the playground, he’d look like every other kid. After spending time with Norrin, you’d probably notice he’s a little different from “typical” kids his age but his smile alone wouldn’t give anything away. This article (written by me) was originally published on Parents.com/To The Max. It has been revised for Atypical Familia. It’s nice to see your experience and explanation of autism. I’m an autistic person and now I have study in college. NB : Can I ask you about how to grow a motivation in an autistic person (especially who already in college)?